Circulon Elite cookware is hard anodized aluminum with a durable metal utensil safe DuPont nonstick surface both on the interior and exterior. Circulon Elite cookware has the Circulon patented TOTAL hi-low food release system. The interior bottom surface has grooves to provide better nonstick performance. Circulon Elite is made of hard anodized aluminum covered in a nonstick surface that Circulon guarantees will outperform all other nonstick cookware. The hard anodized aluminum is heavy gauge to heat quickly and evenly, and to make sure there are no hot spots. Edges of vessels are flared for easy pouring. Circulon Elite cookware is solid performing traditional cookware. Like most nonstick cookware it is not recommended to use higher heat levels. The nonstick cookware set is popular because it is easy to use. Health matters aside, nonstick cookware is a consideration for everyday cooks who want food to slide off the cookware followed by an easy cleanup. Even when using stainless steel skillets to get that great fond for sauces, experienced cooks will use nonstick cookware for delicate meals like fish and eggs. What is the actual cookware material? The quality of cookware is not determined as much by the external or internal coating, as it is by the main cookware material itself. Too many shoppers looking for ease of use will get nonstick cookware without any regard for the more important core material. Today, nonstick surfaces are being applied to anodized aluminum, stainless steel, copper, and other materials. 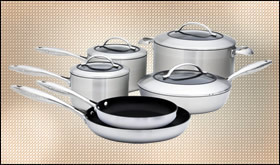 A quality piece of cookware will have aluminum or copper clad inside the cookware. What should I get in a nonstick cookware set? 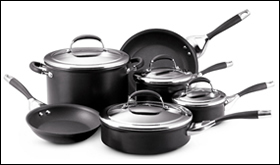 Here is an example of what you should get in a quality nonstick cookware set. This one, at the time of this writing, is the Scanpan CTX 10 piece nonstick cookware set. 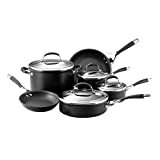 Please note that this is a premier nonstick cookware set, chef grade, that is eco-friendly and considered healthy. One can use high heat and metal utensils on Scanpan CTX cookware. Several manufacturers claim to have the “toughest” nonstick surface. DuPont, the maker of Teflon, has the Autograph 2 nonstick coating as their top of the line product. It is found on a number of quality cookware products including Anolon. T-Fal is known to be very tough. Circulon advertises their Total line to outlast all other nonstick surfaces. If you are going to go with nonstick, stick with a high quality manufacturer. As with most nonstick surfaces, use low to medium heat. Higher heat can not only damage the cookware itself and the coating, but also possibly release harmful fumes. Read the care and use instructions of the cookware. If it claims to be dishwasher safe, is it safe all the time, or just some of the time. Most nonstick surfaces have instructions to clean by hand. As seen in our exclusive article on Matching Cookware to the Cook, nonstick surfaces are suitable for the Reluctant Cook and the Busy Cook. These surfaces are attractive for frying foods up without sticking and an easy cleanup. There are good deals out there, but be sure you get a quality set made of quality cookware materials. One quality material to consider is stainless steel clad with aluminum inside. Check out our article on A Powerful Blend – Stainless Nonstick. Healthy nonstick cookware exists and can make a huge difference in your health and ease of cooking. I recommend 2 brands with excellent products. One might think using the terms healthy and nonstick together may seem like a contradiction. Times are changing, and DuPont in my healthy nonstick cookware selections. 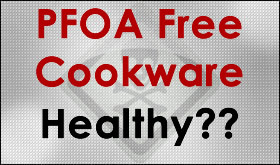 It has long been considered that the healthier cookware choices are glass, cast iron, and stainless steel. Enameled cast iron is very popular, and with a non-porous enameled surface, it is nearly nonstick. Today there are two cookware brands I’d like to introduce you to that offer healthy alternatives to nonstick performance. Scanpan Cookware is a company from Denmark that makes a carbon steel core cookware coated with a ceramic/titanium surface. This ceramic/titanium surface is nearly as good a nonstick as what DuPont makes. The cookware is relatively light, and it is priced reasonably well. Check out the details about Scanpan Cookware. Scanpan now makes 8 product lines, in stainless steel and healthy nonstick cookware. NOTE: I have been using Scanpan classic cookware for several years now and it still has an excellent nonstick surface. The best part: it’s dishwasher safe! Yes, a healthy nonstick cookware that is dishwasher safe. Cuisinart GreenGourmet is a healthy nonstick cookware that is very good quality. I’ve been testing a GreenGourmet skillet for several years and the performance is still excellent. I would not put it on the same level as the DuPont style nonstick, but it does still slide food off remarkably well. Cuisinart GreenGourmet comes in 2 varieties, a stainless steel outside or anodized aluminum. The one I’m testing is anodized aluminum. It heats very evenly and retains heat exceptionally well. Here are a couple alternatives for those looking to use healthy cookware and something different from the usual cast iron, glass, or stainless steel. There will be much more info on these brands coming in the near future.